Before I went on holiday I spent hours researching natural sunscreens and reading reviews. 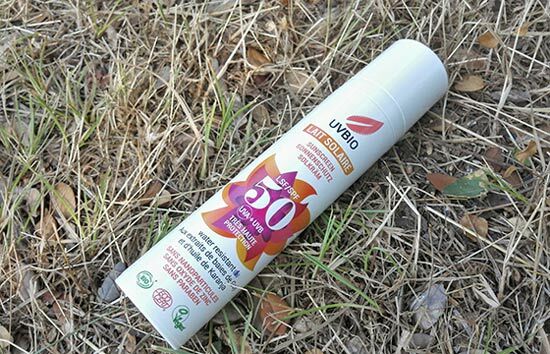 While I was totally happy with the sunscreen I used last year (Annemarie Borlind), this year I wanted to find an extra special natural sunscreen, with SPF50, but not only that, I also wanted to buy something that meets my very strict criteria (more about them later). 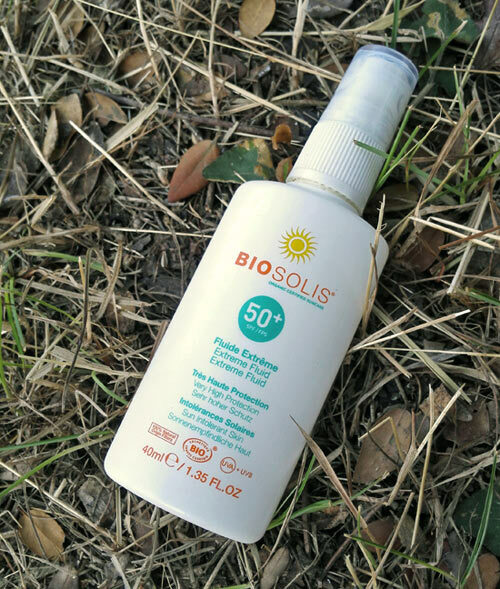 At the end I found Biosolis Extreme Fluid SPF50, natural sunscreen which is certified organic, and it not only protects you from sunburn but it also protects you from premature aging. Read on to find out what I really thought about it. The Biosolis sunscreen sounded great: 99% natural with 25.70% of ingredients from organic farming. Intended for very sensitive sun-intolerant skin. It’s also meant to prevent pigmentation spots and most importantly people who used it wrote some positive reviews about it. 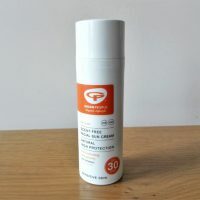 I bought this sunscreen to use it on the most sensitive parts of my body – face, neck and arms – as this is when I tend to get most brown spots when I am in the sun. I ended up using it on my legs as well although I bought another sunscreen for this purpose, but I just couldn’t be bothered to carry two sunscreens with me while cycling/hiking. Luckily, the bottle size of Biosolis sunscreen is perfect – only 40ml which is great for travelling. I actually bought two bottles as I thought one bottle wouldn’t last very long, but I was so wrong! My holiday wasn’t a beach holiday and I spent most of the time protecting my body from the sun with a T-shirt and shorts or ¾ length cycling pants. Most of the time I had to apply sunscreen only to my face, neck, arms and legs; most times only half of my legs needed it. It was only once when I wore a bikini and had to use more of it, but still, it lasted me the whole 2 weeks of holidays (well, I also used some other sunscreen I bought but not that much). The sunscreen itself has a thinner consistency than a sun milk (fluid is a good name for it) and while it absorbs well and it’s non-greasy, it leaves a white cast on the skin which doesn’t disappear no matter how much you try to massage it into the skin. It wears off a bit with time, but still, I don’t think it’s suitable for people with darker complexions. It worked fine for my type of skin, but when I tried it on my boyfriend, I just couldn’t stop laughing at him as he looked like Casper, very unnatural and kind of ill! His skin is slightly darker than mine but it’s also different type of skin which didn’t want to absorb this sunscreen at all and it kind of sat on top of the skin. So I would recommend this fluid only to people who are pretty pale and white, with no tan. It may be also ok for those who use make-up on top as it will help diminish the whiteness. I actually used my natural foundation on top and it worked fine for me. What I really loved about Biosolis Extreme Fluid is that it worked so well for my combination skin and it didn’t cause any breakouts. It takes a bit of time to apply it everywhere as you have to massage it well, but once it’s on your skin, it will stay put for a long long time. It doesn’t rub off very easily and it’s also waterproof. I was actually surprised how waterproof it was, so much that I was having problems washing it off under the shower! Well, that’s a really good thing though as it will protect you very well when you go swimming. However, you still need to remember to reapply once you are out of water. Biosolis Extreme Fluid offers a really good protection from the sun, even really strong sun. I was out and about in the worst heat but I never burnt whilst using this sunscreen. Ingredients list is not too long and does not contain any citrus oils which is a big plus. It’s intended to protect you from pre-mature aging too but I would recommend it only to people with pale complexions as it leaves some whiteness on the skin after the application. 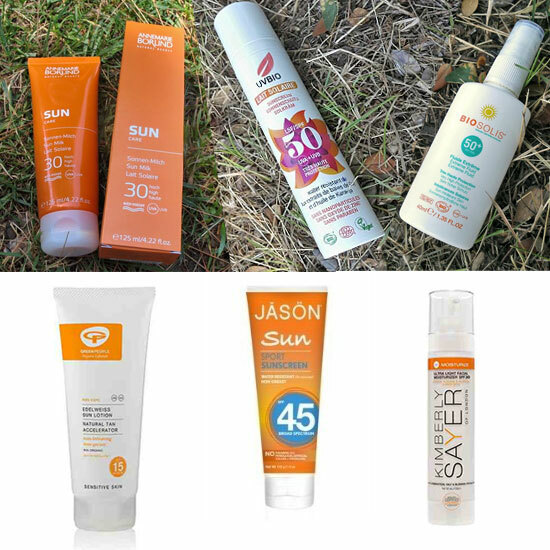 If you are looking for a new natural sunscreen also check some other natural sunscreens which I tried so far.